I picked up this book early in 2012, after reading all the 2011 book recommendation on Pajiba. When I have described the plot to friends, I have been reduced to saying it is kind of like a real life Harry Potter, inasmuch any book about magic can be said to be realistic. The parallels are there, but they are twisted. There is indeed a secret magic school, but it is really an American university with entrance exams, and the all of the students are academic overachievers, many of them socially awkward and all of them fiercely competitive. The students make alliances during their time there, but it is largely based on discipline rather any naturally developing friendships. They are, on the whole, selfish and immature and unlikeable. I spent much of the story wanting to smack the main character in the face. There is no arch villain in the story, no quest – which is really the biggest plot device in the book. These amazingly lucky, gifted people have no plan, no need – they are powerful and aimless. It is both a clever way to lead a book naturally into a sequel, and also an observation on how many young adults have felt over the last few decades, I think. People have found their passion, or their gift, but what now? It is kind of irritating to read about, but is something that I recognize about myself and some friends – but is being able to recognize the issue enough to make it entertaining to read about? 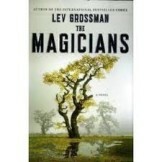 Grossman spends much of the book making learning magic seem both mundane and enormously hard work, and populates the story with some genuinely unlikeable characters. The female characters, and their interactions, are pretty limited in particular. The book is kind of frustrating and boring, and then there are some absolutely beautiful and exciting passages that drew me back in, particularly the trip to the field school. Even months after finishing the book, I am still not entirely sure how I felt about it, although I have since read the sequel – it is certainly interesting, presenting quite a different version of magical education that I have been accustomed to thinking about in the last decade.